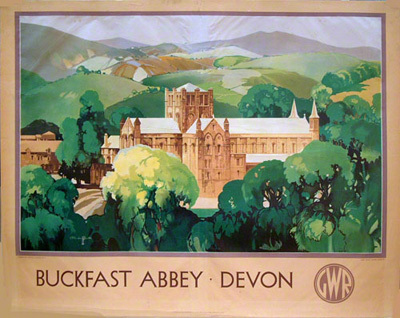 A view of Buckfast Abbey from a railway poster by Claude Buckle. This is the finished poster and has an identical view as the previous picture. This poster is a very early Buckle example. The poster can be dated from the style of the signature which puts it around 1929 - 1930 when Buckle was only twenty four years old. Buckfast Abbey forms part of an active Benedictine monastery at Buckfastleigh, Devon, England. It is a major tourist attraction.